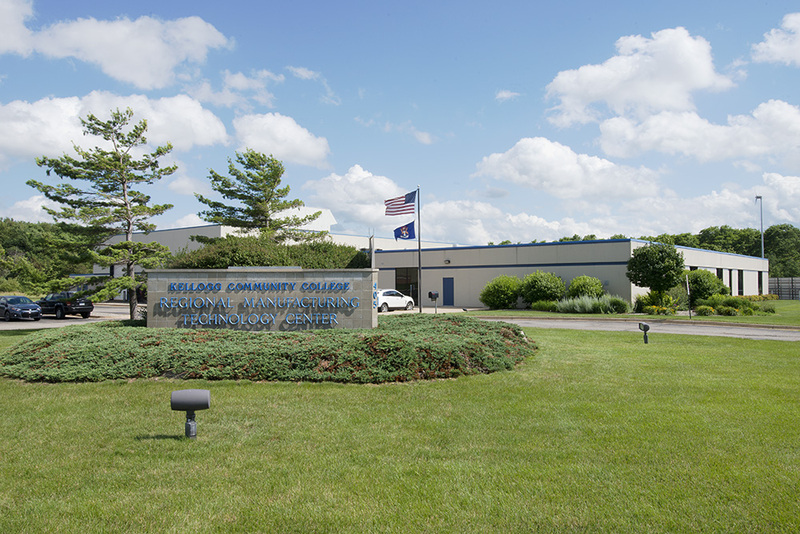 Kellogg Community College today announced a major initiative designed to improve the local economy by guiding hundreds of area adults and teenagers through programs that will connect to job opportunities, strengthen technical skills, improve financial security and accelerate college completion. Thanks to a three-year, $2.85 million grant from the W.K. Kellogg Foundation (WKKF) and the leveraging of partnerships with numerous area schools and organizations, KCC is embarking on its latest venture to expand the local pipeline of talented, work-ready individuals while making certificates and degrees even more attainable and worthwhile. The sweeping initiative is representative of KCC’s abiding commitment to BC Vision, a community-driven effort to spark transformation in Battle Creek and improve economic conditions for residents. KCC will partner with Goodwill Industries, Michigan Works!, area school districts, the Calhoun Area Career Center and the Battle Creek College Access Network to build and implement this new model of career readiness, coaching and supportive services. The programs will be geared toward adults in Battle Creek who are unemployed or underemployed as well as high school students across the KCC service area who want to participate as dual enrolled or early college students. A primary focus of the initiative is serving vulnerable neighborhoods and people of color, who historically have been marginalized and endured higher rates of unemployment and socioeconomic distress. Launch a new Innovative Accelerated Credentialed Training (iACT) strategy – comprised by short-term education modules – for participants to earn college credits and industry-recognized credentials in areas such as advanced manufacturing assembly and production. The iACT initiative, which includes the development of soft skills and financial literacy, is starting at KCC’s Regional Manufacturing Technology Center and will connect with programs at Michigan Works! Southwest and Goodwill Industries. The iACT initiative may evolve to include additional career paths in areas such as health care, information technology and transportation. Expand the College’s existing Kellogg Advanced Manufacturing Assembly (KAMA) program, which combines a simulated production environment with career coaching and soft skill training. Leverage partnerships with K-12 school districts, workforce development organizations and nonprofit agencies to remove barriers – child care, transportation and finances – in order to engage underserved individuals across the area. Build capacity for the College to recruit and serve teenagers for KCC’s early college and dual enrollment programs, which empower students to complete credit-bearing, transferable college courses and skills training at KCC while they’re still in high school. Tuition for early college and dual enrollment courses is often free for individual students. It is estimated that the new initiative will serve at least 300 adults over the next three years. Participants will join cohorts of up to 20 people and receive a variety of services from the College and its partners. With support from the Kellogg Foundation, KCC is building upon its past success in similar programming. Under a previous grant from the U.S. Department of Labor, KCC purchased $1 million worth of new welding, machining, robotic and other equipment and then served 507 participants in job readiness programs between October 2013 and March 2017. Of those 507 served, 412 earned college credentials, 153 landed new jobs, 128 were retained in their current jobs and 194 received a wage increase. The individual impact of workforce training initiatives like the one KCC announced today is unmistakable. KCC workforce training alum Kenneth Gilbert. In 2015, Kenneth Gilbert of Battle Creek was homeless and didn’t have a vehicle or driver’s license. That year, Gilbert listened to a presentation from a KCC representative at the Haven of Rest, a shelter in Battle Creek. Soon after, Gilbert began a training program at KCC, worked with KCC career coaches, updated his resume and began looking for employment. With KCC’s help, Gilbert earned a job as a machine operator with Advanced Special Tools and later became an inspector at Marley Precision. 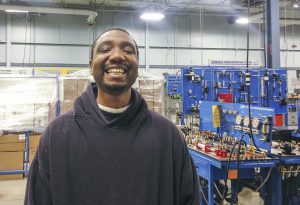 With his own vehicle, driver’s license and a steady job, Gilbert is now continuing his education at KCC’s RMTC with plans to further his career in advanced manufacturing. Because of the generosity of WKKF and other organizations, KCC can engage even more people in the Battle Creek area who are ready to learn, improve skills and find steady employment. Michigan Works! will administer testing for training participants. Participants with English-as-second-language (ESL) needs will be referred to the College’s ESL study groups and other community organizations, including the Burma Center and Voces. Goodwill Industries will provide financial coaching and training via its Financial Opportunity Center, which will include credit score reviews and opportunities to engage with professionals to build social capital, forge relationships with financial institutions and improve money management behaviors. Participants will be referred, as needed, to Goodwill’s Work Hardening program, which provides people an opportunity to transition into employment without being subject to an employer’s corrective action policies. This strategy ultimately improves job retention. Participants with transportation barriers will be supported by stipends for bus fares, gas cards, uniforms, supplies and referrals to Goodwill’s Wheels to Work program. Support from the Kellogg Foundation will be combined with KCC resources to provide for the hiring of several program employees and pay for additional services, supplies and costs, including the tracking of participants and evaluation of grant performance. The College’s existing instructional and administrative resources also will support the grant-funded programs.